On the third weekend of May every year, over 5,000 people pack Bicentennial Park in Madison looking for great Americana music, delicious brews and handmade crafts. 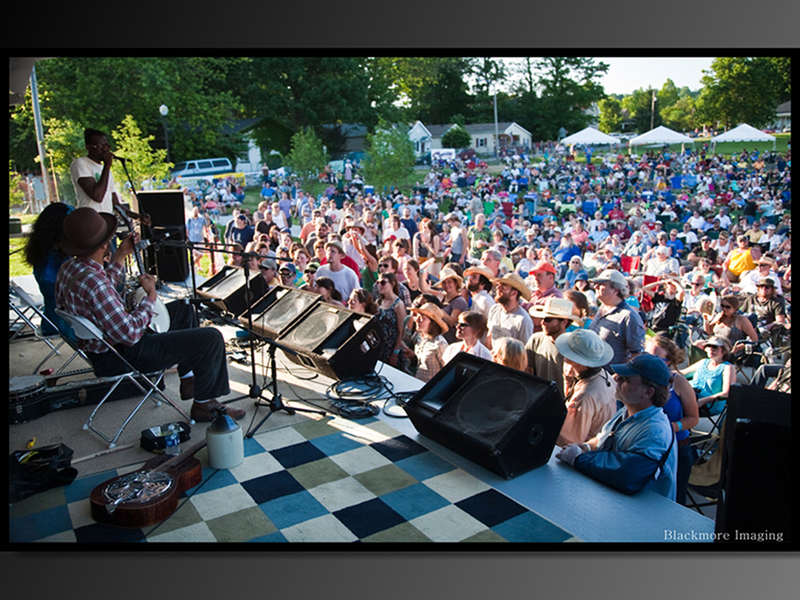 2015 marks RiverRoots Music and Folk Arts Festival’s 10th anniversary. RiverRoots has evolved from a small festival with a few traditional folk music bands to a seasonal highlight. Last year, over 6,500 people came for a weekend packed with 14 bands on two stages and left with catchy tunes in their heads, full stomachs and handmade crafts. Friday evening and all-day Saturday bands alternate from stage to stage. Event coordinator and musician Greg Ziesemer and his team always seek the up-and-coming bands. “We like to change it up as much as possible so we don’t miss out on something special,” he said. In 2010, Carolina Chocolate Drops, an old-time African American folk band, played in Madison and the next year their album won a Grammy Award for Best Traditional Folk Album. In honor of the festival’s 10th anniversary, the RiverRoots Music Series was born this year. Every month through March, they will feature a band that has either played at the festival in the past, or is in consideration for the stage this year. “We want to make it a year-round celebration,” Ziesemer says. Run Boy Run and SHEL were featured last fall and are in consideration for the 2015 festival. Some other bands that Ziesemer and his team are considering are Hurray for the Riff Raff, Shakey Graves, and Paper Bird. The finalized set list will be online in January. But the music isn’t limited to the stage. A Jam Tent will be open throughout the weekend, so be sure to bring your acoustic instruments. For the first time, this year you can purchase VIP passes, which will guarantee premium seating adjacent to the stage and a VIP tent with catered beer, wine and food vendors. The best local food vendors will be making an appearance. In the past, “great eats and cool treats” from Indy’s Mexican favorite Taco Lassi, Cafe de Wheels and Hard Ice Cream kept fans satisfied throughout the hours of music. Ziesemer says they plan to “increase quality and quantity of food vendors” this year. Because the festival falls on American Craft Beer Week, there is also a Craft Brewing Contest, where amateur brewers can sign up to compete for the title of “Best Homemade Beer.” And if you’re not into the beer-making business, the best area brewers will be there to quench your thirst, including SunKing, Upland Brewery and New Albanian. Although the folk music may be the main attraction, there are other activities to do and see at the park. The Flying Houndz Frisbee team will perform, local artists will demonstrate and sell their homemade crafts and “plein air” painters will capture the event live on canvas, selling pieces immediately after finishing them. Canadian National Poetry Slam Champion Ian French (also known as IF) may perform on the second stage or in the Jam Tent at the festival as well. Tickets will go on sale Feb. 1. Admission for adults is $20 before May 1 and $30 at the gate, but kids 12 and under get in free. All registrations and applications can be found at Riverroots.org, and you can check them out on Facebook as well. Head to Bicentennial Park on May 15-16 to hear, see and taste the folksy side of Southern Indiana.